Congrats to Isenberg Women in Business for a Fabulous Conference! Yesterday, I had the pleasure of attending the 2017 Women of Isenberg Conference, organized by the Isenberg Women in Business Society at the Isenberg School of Management. The conference took place at the Campus Center of UMass Amherst. The conference is now an annual conference, with the inaugural one taking place in 2014. I had the pleasure of being a panelist at the second conference in 2015. As we registered for the conference and picked up our elegant badges, we were greeted by a sign, and by members of the conference organizing committee. The conference with about 350 attendees, mostly women, and a few very welcome males, including my Finance colleague, Professor Nikos Artavanis, was a huge success. I was very much looking forward to the conference, since I had nominated two of my former Operations and Information Management students, now alumna, Johanna Zuber and Zheng Ding, as panelists, and they were selected. Johanna spoke on the Networking panel and Zheng on the Mentoring panel. Johanna and Zheng had been in my Logistics and Transportation class at the Isenberg School of Management and, after working in big companies, are now both at startups in NYC. The organization of the conference was truly outstanding and the Isenberg Women in Business Society is an undergraduate student club so kudos to the officers, its members, and to all the volunteers for a great day. There were keynote talks, multiple panels, and a lunch that was exquisite. I had the salmon, salad, mushroom risotto, with roasted veggies (beets, squash). It was served efficiently buffet style and then we brought our food back to the large room to listen to a very interesting panel on career challenges with four professional females from Pratt and Whitney. One, who works on global supply chains, had arrived from Poland at 2AM! The full list of keynoters, panels, speakers and panel members, can be accessed here. It was a terrific time to catch up with alumnae and some staff plus faculty. I very much enjoyed all the panels that I attended and the discussions along with the Q&A. There was a great deal of energy and style present and support for one another at this special conference. Plus, the treats during the afternoon coffee break were simply exquisite. I thought I was back in Paris. The advice offered throughout the day will, I am sure, benefit all attendees, as well as the new acquaintances made. The nice canvas bag with amenities inside is a nice memento of a very rewarding day. I am thoroughly enjoying teaching my Humanitarian Logistics and Healthcare class this semester at the Isenberg School of Management. The students are always willing to discuss and share their experiences and the time goes by much too quickly. A very important feature of this class is the guest speakers that I bring in who are expert practitioners. 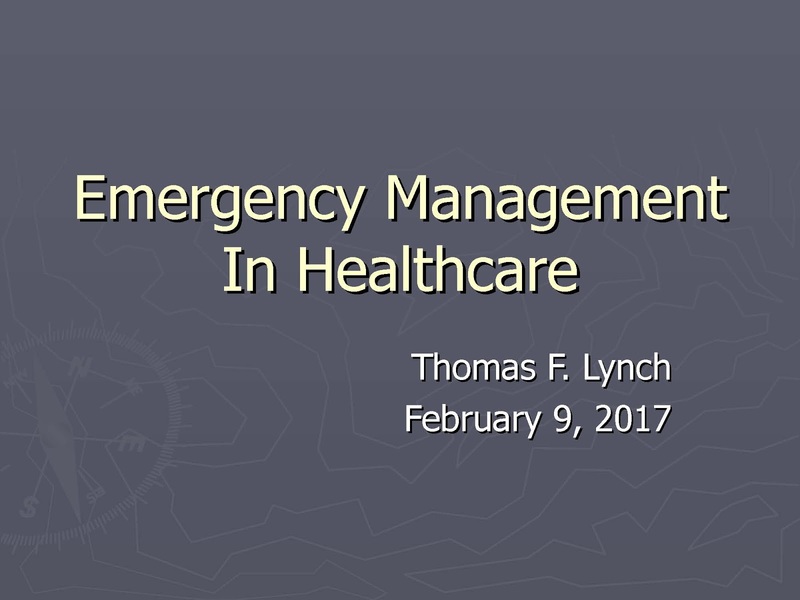 Mr. Thomas Lynch spoke on Emergency Management in Healthcare to my recently. (Since February 9 was a snow day at UMass and the university was closed, we are grateful that he was able to reschedule his talk for February 16.) He spent about two decades working in security and emergency management at Baystate Health in Springfield, Massachusetts, and, before that, about 10 years working in security at Mount Sinai in Manhattan. He was a terrific Professor for a Day! He even brought multiple handouts for the student. Baystate Health is a major trauma center in Massachusetts and Mr. Lynch shared with the students the importance of drilling, drilling, and drilling. When there was smoke next to an operating room, where a surgery was taking place, the medical team was prepared and had practiced and moved the patient (who was opened up) to another surgical unit where the surgery was successfully completed. He provided the class with information on a hazard and vulnerability assessment tool for events that a hospital such as Baystate must be concerned about from hurricanes to snowfalls and now even tornadoes, since we had one in June 2011, as well as floods and droughts, along with the estimated probabilities and risk measurement. There have been plans made that are derived from the hazards and vulnerability assessment for such incidents as: mass casualty, fire, weather events, hazmat (internal and external), bioterror, infant abduction (which worried him the most), evacuation, active shooter, a civil disturbance, and an IT outage. He also shared with us that, after Hurricane Katrina, the costliest natural disaster in US history, each hospital must prepare an emergency sustainability plan for 96 hours. This means that a hospital should be reliable/functional for 96 hours post a disaster without outside support. Hence, Baystate has a five day supply of food on hand. There is also a warehouse filled with pandemic supplies of 30 days. Since communications are essential to emergency preparedness and disaster relief, there is a backup phone system, cellphones for redistribution, and even 100 radios that can be put on a single frequency and a mobile satellite phone. The facility has 30,000 gallons on campus of fuel capacity which should be sufficient to sustain operations for 96 hours. Mr. Lynch emphasized that it is important in an emergency to take care of yourself first and that is what the medical professionals are also trained to do. They also must take care of their families since otherwise they would be distracted about their welfare to do work. Only then does one worry about property. It was very impressive to hear how the regional hospitals meet regularly to exchange best practices and also work with firemen and police departments. Relationships are critical and are built over time and they must be in place when an emergency or disaster strikes. Mr. Lynch shared with us his varied experiences as to the responses various scenarios from barricades (which required rerouting of staff and ambulances) to shootings to a major explosion with 8 burn victims that were not readily identifiable. He also stated that when the Ebola crisis in western Africa peaked a few years ago that Baystate Health was one of a handful of centers in Massachusetts selected to be a treatment unit and it took them 18 months to prepare for this. Mr. Lynch's presentation can be downloaded here. 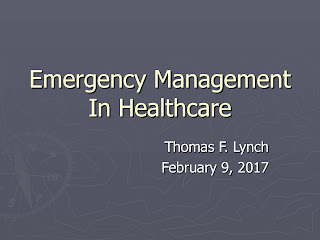 Bay State Health (and we) are very lucky to have such a consummate emergency and security professional in our midst as Mr. Thomas Lynch and we thank him for all that he has done for our major hospital and its community! The Isenberg School of Management started this year a great speaker series, which takes place at the UMass Club in downtown Boston. Last Fall, the inaugural lecture was given by Steve Wozniak, the cofounder of Apple, and I blogged after this event. 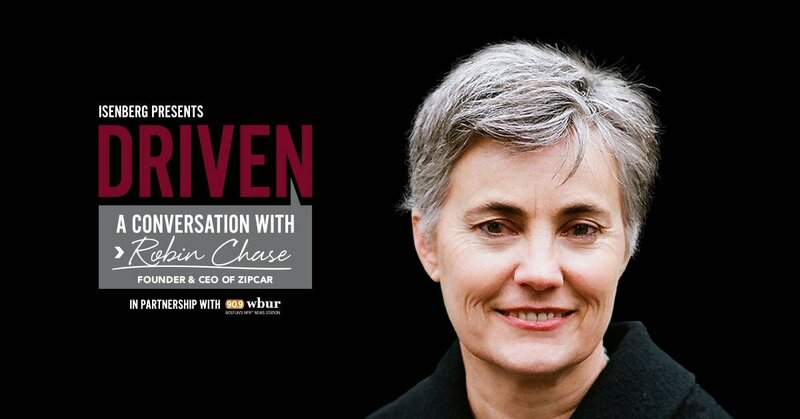 This evening, the speaker was Robin Chase, an entrepreneur and cofounder of Zipcar, who, as she said, has become a real transportation wonk. Given that I teach a course on Transportation and Logistics and have also done a lot of research in this field, it was a fantastic opportunity to hear from her. She was introduced by our Associate Dean, Professor Tom Moliterno, and Asma Khalid from Boston's NPR station, WBUR, was the interviewer. Robin has a degree from Wellesley College and an MBA from Stanford. She took us back to 2000, when she cofounded Zipcar, and knew very soon that it would be very successful, so her husband left his day job and became a full-time parent for their three children, ages 6, 9, and 12 then. Zipcar, according to her, was the third consumer product with wireless. She emphasized the importance of origins and destinations for trips as well as the types of different trips that people take in cars. She believes that Uber and Lyft could not have raised a penny if we didn't have Zipcar. Although there may be some cannibalization, Zipcar users use this service for different trips than those who utilize Uber and Lyft. She called them taxis and finds them to be complementary to Zipcar. She also talked about Buzzcar, which she founded and which has been successful in France. It is a peer to peer car sharing service. She tried to get insurance for it in the US without any success and after 5 years gave up but managed to secure insurance in France within a year. I appreciated very much that she advised that one should not break rules on health and safety as a company. Four years ago she co-founded Venium, which provides low cost, reliable connectivity in vehicles and uses radio technology. She believes that Venium will be bigger than Zipcar. Some of the conversation focused on whether there is a place for car ownership in the US in the future. She believes that private cars will be excluded in dense cities in the US by 2030 and that this will happen in Europe and parts of Asia much sooner. She envisions the increase in land as providing space for bicycles, more greenspace, more low income housing, and cleaner air as well. Why spend $9K per year for a car if transport can cost you only $3K. I liked her statement that "people will follow the economics." She was very honest and sincere and spoke of the failure of her startup Goloco, which received $2 million in funding in 2009 and then she had to give back half of the funding two years later. People in the US just did not like sharing rides. She also emphasized the importance of a critical mass and mentioned that BlaBlaCar has been successful. She believes that we will have use of self-driving cars by 2020-2021 because of automation in the car sector. Of course, there will be impact on truck drivers and bus drivers as well as insurance companies. With 35,000 people dying in traffic accidents last year in the US autonomous vehicles can improve safety. She also noted that the single biggest barrier to alleviating poverty is access to quality transportation Clearly, car ownership of the future will differ for those residing in dense urban areas and those living in suburbia. We are now in a platform economy and there is a political opportunity to do better than we have done in the past. The Q&A were excellent an I especially appreciate the question about cybersecurity and autonomous vehicles since we have published several papers on cybersecurity and cybersecurity investments and network vulnerability. The Isenberg School livestreamed this event, which had not been done for the Wozniak evening. Many thanks to Robin Chase for a fascinating conversation and to Asma Khalid for keeping the conversation flowing so well. We have had 2 major snowstorms in the past 5 days in Massachusetts and UMass Amherst, along with most schools and colleges, was closed last Thursday. This morning, the commute was a bit dicey but there was not even a scheduled delay on our campus. Below is a photo of the accumulation of the snow from the two storms, so you have an idea. This spring I am again teaching my course on Humanitarian Logistics and Healthcare and I regularly blog about the guest speakers in the course. This term there has been some disruption management necessary since not only have two of my classes been cancelled, due to snow, but also, because of the Presidential Executive Order on immigration, my first guest speaker, Mr. Jeff Hescock, had to reschedule, but, speak he did, last Tuesday. Luckily, all went smoothly after the Patriots superbowl win so he did not have to postpone again. Never a dull moment at a university, I must say. Mr. Hescock is the Director of Emergency Management and Business Continuity at UMass Amherst, and, coincidentally, he is part of the team that makes the decision of whether to close UMass Amherst due to weather. This, of course, was very interesting to the students and, also, rather timely. Mr. Hescock shared with the class how the campus responds to emergencies and emphasized the importance of coordination with police and fire departments and the necessity of being more efficient. He noted that the tragedy at Virginia Tech in 2007 was the game changer for emergency management at universities, signalling that an institution, such as a university, cannot have big delays and "sign-offs" from multiple stakeholders before notification and action are taken. Prior to Mr. Hescock's appointment at UMass Amherst in 2013, he had worked in the UMass President's office and also assisted in the evacuation of UMass Dartmouth post the Boston Marathon bombing on April 15, 2013, another date that is permanently cemented in my memory. Mr. Hescock emphasized the importance of training and educating alternate persons who can take over in the event of a university emergency as happened last spring at UMass Amherst with an incident taking place during the public school vacation break, during which some of the emergency staff were away. Hescock is a leader in securing grants for a variety of emergency preparedness initiatives and I have personally taken part in a big exercise for sheltering at the UMass Mullins Center. You can read my blogspot on this exercise, which also has a lot of photos, here. The campus has a hazard mitigation plan and this past year the drought was a big issue. Luckily, UMass can notify students and staff to decrease their water usage and emphasize the importance of doing so. I appreciated that he also brought up "enterprise risk management," since my research team does a lot of work on supply chains and viewing them holistically as systems and we also work on vulnerability analysis of networks. In addition, the necessity of meeting with many different stakeholders in order to be prepared for emergencies is essential, and, in the case of a university, that would include the facilities group, the compliance group, among others, in order to assess risk. He also stated that the most dangerous spot on campus is a cross walk. There exist templates already in the computer system to get a message out as soon as possible, which is reassuring, and I can speak to the fact that, with the incident last year, the notification system, in the form of loudspeakers, email, and text alerts was very effective. Now we can sign up for practice exercises in the case of a similar incident. UMass Amherst has 13,000 students living on campus and has about the same number living off campus. It has one of the highest on campus number of student residents in the US. When need be, given the importance of communications, crisis communication experts are kept on a retainer. UMass Amherst also has MOUs with the Five Colleges in our area, with the state police, Amherst police, and also MEMA (Massachusetts Emergency Management Association). I will be hosting a speaker from MEMA in the class next week. Mr. Hescock has also worked for MEMA and has worked in the private sector, where he appreciated the funds. He brings a wealth of experience and practical know-how. He, for example, made sure that there were backup generators for the cold storage units for food at UMass Amherst. And told us that UMass generates 60% of its electric power. It was an oasis that my family and I benefited from when we had the freaky Halloween snowstown in October 2011 and lost power for about 5 days in our home in Amherst. Getting a hot cup of coffee was a challenge, not to mention a hot shower. We ate many delicious meals at the UMass dining halls (I felt guilty having lobster during the power outages but enjoyed it immensely). It is a wonderful educational experience for students to hear from expert practitioners such as Mr. Jeff Hescock. He was a terrific Professor for a Day and we thank him! It has been a very busy time since my article, "Uncertainty in blood supply chains creating challenges for industry," was published in The Conversation last month, and not only since the new semester has begun at the University of Massachusetts Amherst! The article was reprinted in several publications, including: Salon, the San Francisco Chronicle, the LA-based magazine GoodHealth, and even ORMS Today, the magazine of my favorite professional society, INFORMS, made a note of it in the February issue. Since my article's publication, I have also received numerous emails from around the world, including from researchers and practitioners in the United Kingdom and in Israel, as well as from the United States, and have had extended conversations as well. In particular, I very much enjoyed speaking with Dr. Brian White and Jarrian James of Bloodbuy. Dr. White wrote this interesting blogpost: "Bloods and circuits: The RAND Corporation report on the role of technology in maintaining a stable blood supply," which references my article in The Conversation. The Isenberg School of Management posted this piece by the Isenberg School's terrific Senior Editor, Lou Wigdor, entitled: ``Lessons learned from blood supply chains," which noted my wonderful collaborators on blood supply chain research, who were two of my former doctoral students: Dr. Amir H. Masoumi of Manhattan College and Dr. Min Yu of the University of Portland. Together, with the "other" Professor Nagurney, we co-authored the book, Networks Against Time: Supply Chain Analytics for Perishable Products, which was published by Springer in 2013. I also was interviewed by Karen Brown, an award-winning health journalist. You can listen to her report: "America's blood economy: Vulnerable to economic trends, health advances"
on New England Public Radio. The full transcript of the radio segment can be viewed here. And our research on the topic of blood supply chains in the new economic climate continues. I will be presenting the paper, "Mergers and acquisitions in blood banking systems: A supply chain network approach," co-authored with Drs. Masoumi and Yu, at the IFORS conference in Quebec City. Also, Pritha Dutta, a doctoral student in Management Science at the Isenberg School, will be presenting our paper, "Competition for blood donations: A Nash Equilibrium network framework, "
at the New England Decision Sciences Institute (NEDSI) Conference, which is being held not far from Amherst, in Springfield, Massachusetts, next month! There is a lot to be gained and learned from guest speakers, whether in a class or in a more open setting -- no wonder the popularity of TED talks, for example. Another aspect of hosting a guest speaker, who is an expert on a topic, is the networking opportunities and, frankly, the creation of memories and even friendships. I have a lot of experience hosting speakers, starting back in 2004, when we began our UMass Amherst INFORMS Student Chapter (which just launched its new website), along with its Speaker Series. Through that series alone, we have hosted over 100 speakers and the list is a Who's Who in Operations Research and the Management Sciences with also speakers who are intellectuals and visionaries but not necessarily academics or practitioners taking part - I would put Tom Vanderbilt in that category - the author of Traffic. The students do a tremendous job helping me with the speakers. This is essential since a lot of work goes into organizing a Speaker Series and carrying out not only the marketing for the talks but also the logistics behind them. One of my most popular blogposts continues to be: Tips on Organizing a Successful Speaker Series. The same holds for hosting speakers within a class which I do in my Humanitarian Logistics and Healthcare class, which I am now teaching at the Isenberg School of Management, and have taught in the spring term for the past several years. However, despite the best laid out plans, things happen. Although in our public speaker series I just recall one cancellation, which is truly amazing and lucky, although there were times when I was waiting at the door for a speaker traveling from out of state with only 5 minutes to spare for the scheduled talk to begin and there was even a camera and news crew waiting - anxiety-provoking, but so worth it when they deliver and the audience is so grateful and appreciative (and so am I). Part of my Humanitarian Logistics class focuses on emergency preparedness and business continuity, which is rather fitting, since we get to practice disruption management. Two years ago, in this course, we had some real life drama. I received the email message at 5:30AM that the speaker was cancelling for my 8:30AM class (always be prepared is my motto and I had a great lecture ready, in any case). The week prior, the guest speaker, Mr. Brian Rust of Cooley Dickinson Hospital, had to contend with multiple emergencies, beginning with a computer failure on Monday, which was fixed by a Cisco switch brought in from eastern MA, followed by complete communication failure on Wednesday (supposedly not related to the Monday one) with no Internet or phone lines available. Hence, medical records could not be accessed, and CAT scans and X-rays could not be read. Back to documentation on paper, which he said the older healthcare providers were comfortable with since they had used such basic approaches earlier in their careers, in contrast to the more recently trained healthcare workers, which are so dependent on computers. Appointments had to be cancelled. This major disruption was fixed on Wednesday but then Wednesday afternoon a sprinkler pipe burst and flooded the back of the Emergency Room with thousands of gallons of water pouting in. The water pouring in was dark and the texture of oil, he said. There is a new cancer facility being constructed above the Emergency Room area and it seems that the pipe was not properly insulated and it was one of the coldest winters on record in Massachusetts. With facility experts on hand (luckily, he said, not everything had been outsourced), in a few hours the area was cleaned up and disinfected. During that period, however, ambulances had to be diverted to other hospitals, which can be "expensive" in terms of additional time needed for delivering the patient and in that Cooley Dickinson loses any financial compensation since it did not serve those patients. He noted that 4 ambulances were diverted. The students and I were disappointed, although quite understanding, that he could not speak on that Thursday but when he did give his guest talk at the next class, it was gripping, to say the least. And, last Thursday, the guest speaker in my class was to have been Mr. Jeff Hescock, who is the Director of Emergency Management and Business Continuity at UMass Amherst. He has done extraordinary things at UMass and is a fabulous speaker. He notified me late last Wednesday that he would have to postpone his talk because of issues surrounding the Executive Order (EO) that President Trump had signed regarding immigration and refugees. Yes, the EO had affected some UMass students and even faculty who could not return back to the US and an emergency meeting was called in Boston for Thursday! I was disappointed that he cancelled last Thursday, as were the students, but we hope to host him tomorrow and are looking forward to it. The students have prepared some fascinating questions for him. Plus, my very first Humanitarian Logistics class was cancelled this semester because of inclement weather (Mr. Hescock is part of the group that makes such decision), so I predict no snow tomorrow.